A Passion for Paris returned last week with a lovely post from La Mom Paris. I am so excited to bring you the story from another Parisian expat, Daisy de Plume who’s the founder and creative director of THATLou, which runs themed Treasure Hunts at the Louvre (among other museums). We met through a mutual friend so I have yet to experience her titillating museum event, but I am looking forward to trying it one day. You can find her in the usual spots: on her blog , Twitter, Facebook or Pinterest. She lives on the Right Bank with her Argentine husband and their toddler, Storsh, who shows his belly on request in any of his three languages. Daisy shares her passion for the city of light with us this week. Behind Gare St Lazare 1932 Henri Cartier-BressonBefore I moved to Paris 8 years ago I had a dismissive, social-floozy relationship with the city. I’d been here countless times, never for the city itself, but for a myriad of other reasons. My best friend grew up on the Côte d’Azur and my godmother had a country house in Brittany. To see them both, Paris was a natural airport hub. Nearly each summer I’d have a weekend here shuttling from one place to the other. Generally I’d see friends here for those crammed-in overnights before a flight home or a train south. It was all very superficial. In most cities I insisted on walking everywhere to get a lay of the land, to see how landmarks connected, to understand the metros and whatnot. Paris? I’d just taxi it over to Fred’s in Neuilly, or up to Hélène’s in the 9th, etc. The only clue I had was that I hadn’t one – I was indignantly aware of my own ignorance, and “I didn’t care”. Clearly feeling guilty, I would justify my ignorance with architectural snobbism. A venal quality: Education is to enrich, not justify! I’d been raised by a mother whose taste (and indoctrination) weighed heavily on Rome, focusing on the Classical and Baroque. Throughout growing up I had many stints in Europe – boarding school and years-abroad in Rome, Florence and London, but never touched foot in France for any substance. Paris was my stomping ground of social-fluziness and that was that. It was pretty, sure, but nothing one could take seriously, other than for perfume and fashion. It was just another 19th century town, not much different really from DC with its sweeping Haussmannian boulevards connecting one heavy-handed landmark to another. Name a landmark and I’d rattle off a date – nearly all from the 19th century (l”Arc de Triomphe 1806, Eiffel Tower 1888, Grand Palais 1897, Sacré-Cœur 1914). Pshah! Paris was overrated and it was ok that I didn’t know a bit about it despite my mileage here. Then in my late 20s, from 27 – 30, a heavy cloud stopped over my shoulders. My grandmother fell ill and after a series of hospitals, died. We had been very close, especially as I matured and appreciated that my father’s death wasn’t only my loss; she’d known him slightly longer than my 21 years. The minute Didi fell ill I grew up and had to learn how to handle a flock of lawyers, doctors, medical-insurers, then morgues and law suits and nastiness. I was executrix to her will and had to clear her enormous flat out of 3-generations of STUFF. Life became serious. I became serious. When I wasn’t handling that I found refuge in working too hard at my magazine job (which had originally been fun fun fun, and not too much work!). My naturally social-self vanished, and needless to say my regular stints abroad ceased. Hidden in my seriousness, isolated in her beautiful, sad penthouse overlooking the Hudson with West Village rooftops in the foreground, France somehow came to me. In mediums I’d never really paid much attention to. Food, Films, Literature, Photography, Ballet at the Joffrey. Three characters took on immense importance. And as Paris was their city, calcified in who they were, I realized just how ignorant I was of this city I’d always spurned so casually. First there was Honoré de Balzac. Not necessarily the best writer in the Western Cannon, but a fantastic observer and story-teller, and I gobbled up nearly all of the Paris volumes of his Comédie Humaine (90-odd novels with interweaving characters). Père Goriot killed me, how cruelly his daughters treated him, same for the tragic Colonel Chabert. On a lighter more charming note I had François Truffaut films, which I watched with pen scribbling in my film notebook, tracking Antoine Doinel’s sassy ways as he truantly crossed Paris as a child in 400 Blows and skipped-out on jobs (and women) as an adult in Baisers Volés. Lastly there was Henri Cartier-Bresson. I was working for David Friend, Director of Creative Development at Vanity Fair, and former Photography Editor of Life Magazine. David knew all the old warhorses, including Cartier-Bresson, and it was his photography in particular that I honed in on. 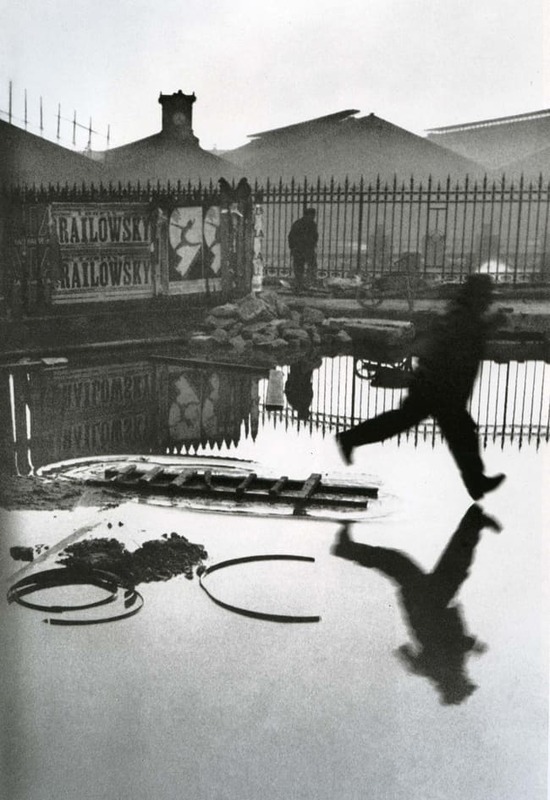 The grandfather of photojournalism, one of the founders of Magnum Photos and a towering figure behind the lens, it was HCB who snapped the ‘Decisive Moment’ (the landmark photograph taken behind Gare St Lazare where Cartier-Bresson captured a moment of a figure jumping over a plank, just before his foot makes a huge splash in the puddle). Shanghai (Didi’s city and, like Paris, one where I’d been numerous times but didn’t know at all) and tails – Paris. Obviously tails won, so I rented a flat in the Marais– telling myself I’d return just before the elections to volunteer for Kerry – and arrived for the first time to visit Paris for Paris. I was guarded, doubtful even that I’d like it. But I had to see. My intention was to scrutinize it from the prism of Balzac, the lens of Cartier-Bresson, the silliness of Doinel, and then return to reality 4 months later. Flash! The decisive moment happened! I fell instantaneously head-over-heels with Pourrie Pourrie, Paname, Paris, and all those melodic tunes and fetid smells. The metro alone was enough to love – that metallic smell being pushed through the tunnels, the splendid buskers (a 13-piece string orchestra playing Châtelet! ), Malraux’s theatrical stations like Arts et Métiers. It was all just grand. Life was grand. Paris was grand. Before even boarding the plane to NY 4 months later I realized that no matter how irresponsible it was to really leave my life and no matter how hard it was going to be to make Paris mine (visa, language, unemployment level, $-€ exchange being rot) I was only going home to help out with Kerry. In a very short time Paris had clearly gotten under my skin. When Bush won, of course, the decision was sealed! Merci Daisy, that is quite a story! wow, what a story teller, what about her life after Bush had won? @Daisy, my pleasure, I was thrilled to have you. Everyone has their own unique way of telling their Paris story, it’s why I love this series! @Margaux, your comments make me smile, there are so many things about France and Paris that I love in which my husband, a French national, rolls his eyes at. But I can also say the same for my reaction to some of the things he likes about the US that I either take for granted or think is bizarre! Fascinating story of coming around to Paris. It’s humbling, isn’t it? This post made me verklempt. And, it made me feel like a fool for some of the complete nonsense I’ve published on my own blog. The Blogosphere is a magnet for the quick and light. This was such a gift. The part about your realizing your grandmother also lost your father – it is such an adult realization, huh? Daisy de Plume is a great writer’s name. I hope this is just an excerpt from a memoir in the works or yet to be. Thanks for sharing. Awesome series, Andi. @Ned Thanks! And Yes, the whole thing was marvelously (and necessarily) humbling. @Jen Wow, that’s really lovely to read. Thank you very, very much. I, too, have put plenty of quick and light out there, but I was really honoured Andi included me in this fantastic series. And then once I started writing it sort of flowed. When I sent it to Andi I told her I felt like I should offer her a shrink’s bill, because it was so cathartic to write it all out. My grandmother’s death and my move here are inextricably tied, and somehow I’m very glad to see that after 8 years that’s still not so far from my surface. Am very lucky to both be here and to have had her for as long as I did. @Andi, again a humungoid thanks for this. If I ever do write a book (no plans as I’d like to take the world on with treasure hunts at museums first!) I will have you to thank as the person who prompted my beginnings. At the time I wrote about 450 pages, and lost it all because I didn’t back up my Mac. Dope! It was a bad period, which Paris fixed marvelously as it does nearly everything! Daisy, Your story is so beautifully written that I was completely absorbed by your words. Even though I’ve learned about bits and pieces of your life during our brief meetings, I had no idea about all of the other events, like the coin toss, which prompted you to move here. Any chance that there will be a second installment because you’ve left me with many unanswered questions? Your portrait is stunning – it conveys serenity and great depth of character. What a great guest post! I now know even more about the lovely Daisy and her love affair with France! 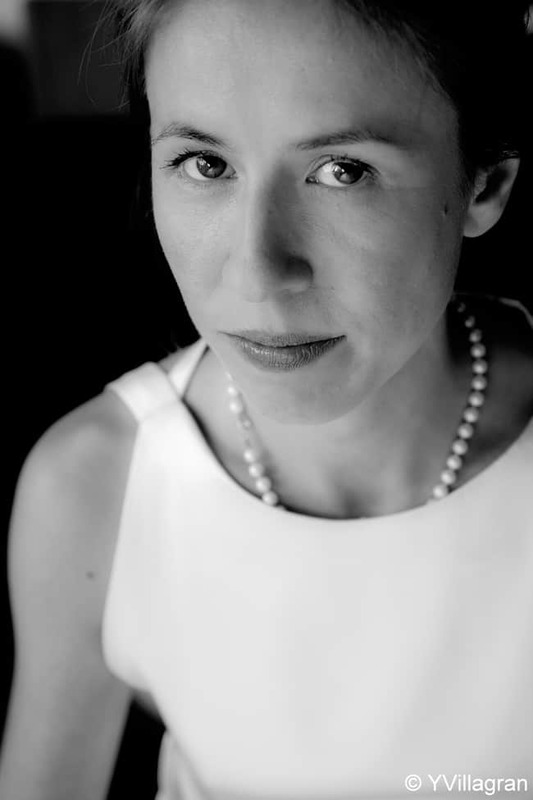 Amazing storyteller and passionate expat – thank you for featuring Daisy! Love this post! My favorite line: “. . . I had a dismissive, social-floozy relationship with the city.” I used to dream of leaving the country when Bush was elected, too. I hope to make it to Paris someday. @April, I hope you do. I escaped the country when we went to Iraq the first time. It is amazing to live outside the country when you don’t agree with the current political environment! This is a great story, and I love learning about people who were able to travel so much, especially since I really haven’t had the chance, but I just wanted to comment on the THATLou program. What a cool idea – to do themed treasure hunts in museums! I’ll need to see if this is done in any US museums, but it sounds like such a great way to get people into places they tend to forget about. How clever and fun!! @Erin, I agree that it would be a great idea in any museum! Daisy de Plume is a wonderful person. I had the chance to meet her a couple of times through the THATLou event and then also for the occasional work lunch because our offices are actually very close to one another! Great feature – I hope word on THATLou spreads much more quickly! @Milsters, I have not met her in person but will try to on my next trip. I am going to try to do another blog meet-up next time. I am going to be featuring THATLou in December, I think it is a great project! Lovely story. I was also quite taken with the photograph! @Mary Kay Thank you. I really respect your opinion and what you do with your Out and About in Paris blog (and that you don’t do it for a business. I feel no guilt at being involved in this lovely blogging community because of THATLou, but yours is a pure endeavour, and purity is admirable). Yes, eventually there will be a second part to this tale. But for now, it is thanks to Andi that I got a few paragraphs out on an intense period that led to fleeing NY. And one thing at a time – that’s THATLou for me now. @Kristen Thank you, darling . Can’t wait for our dinner with Kasia on Wed and to hear of all the KALE IN FRANCE progress you’ve made while I’ve been in Buenos Aires! @LadyJennie Thank you. I tried to leave a comment on the 27 Dec 2011 post you did on your blog but wasn’t able to. I’m not particularly sentimental, but your writing and honesty and horrendous experience and strength certainly moved me to more than tears, but Balling. You’ve given a gift in sharing (which also clearly was something you needed to be able to do, share). SO thank you back. And thank you to Andi for introducing us. @April You WILL make it to Paris! And when you do, look me up — and go for a THATLou if it’s up your alley! @Erin Thanks!!!!! I have a THATMet for The Met in NY, but nothing for other museums in NY. It makes me really happy to think of anyone appreciating the idea of a treasure hunt in a museum and having fun with it. Needless to say, if you’re ever in Paris, pls join a THATLou, and if you are in the NY area drop me a line for a THATMet! @Kristy Thanks! YVillagrin is a great photographer! I first met Daisy through her THATLou events (which I recommend to everyone and anyone who will listen!) and she has since become the big sister I never had. Even though I knew bits and pieces of how she came to Paris it was so wonderful to read the whole story, and I could hear her as I read this, it’s so her voice. Thank you for featuring Daisy’s story! @Edna, how could I not, she is amazing and such a talented story-teller. I am a recent fan of your blog and love it! @Edna! 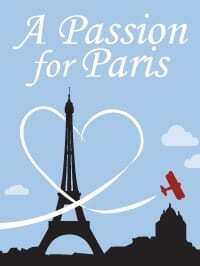 Thank you so much for linking Andi’s Passion for Paris piece to your Expat Entrepreneur interview of me. That was really lovely of you. And somehow it’s funny to think of you reading this, because for some reason I’ve told you so much about Didi. Perhaps because there are some possible similarities with your father. Andi – Juliette has returned from Paris and brought me macaroons. They’re divine. She wants to move there for a year – maybe a gap year. It’s always wonderful to hear from Daisy. I hope you’re having a great summer, Andi! @Jen, yes! I am so glad she loved it! A year in Paris would be an amazing start to your adult life!